The World Health Organisation (WHO) has said that processed meat is as big a cancer threat as cigarettes. Inaccurate. 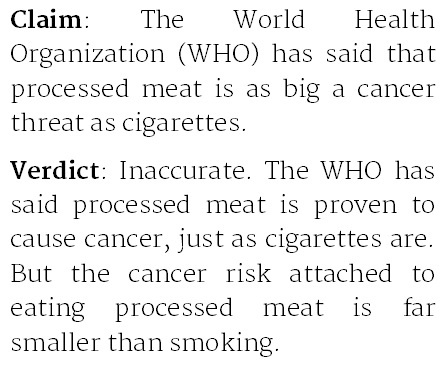 The WHO has said processed meat is proven to cause cancer, just as cigarettes are. But the cancer risk attached to eating processed meat is far smaller than smoking. "Bacon, burgers and sausages are as big a cancer threat as cigarettes, global health chiefs are to rule." "UN health body says bacon, sausages and ham among most carcinogenic substances along with cigarettes, alcohol, asbestos and arsenic." Did the World Health Organization (WHO) say that processed meat is as likely to cause cancer as smoking? No. The International Agency for Research on Cancer, part of the WHO, found that scientific evidence is now strong enough to say that processed meat can cause cancer, specifically colorectal cancer. Like smoking, and exposure to asbestos, it's considered beyond doubt that eating processed meat increases your risk of developing cancer. That doesn't mean it increases your risk by anywhere near an equivalent amount. "The experts concluded that each 50 gram portion of processed meat eaten daily increases the risk of colorectal cancer by 18%." It's important to put this kind of number into context. "In the normal run of things, around 6 in every 100 people would be expected to get bowel cancer in their lifetime. If all these 100 people ate a three-rasher (around 50g) bacon sandwich every single day of their lives, then according to this report we would expect that 18% more would get bowel cancer — which is a rise from 6 cases to 7 cases. So that's one extra case of bowel cancer in all those 100 lifetime bacon-eaters." In contrast, the chance of getting lung cancer in the UK increases from around one in 100 if you don't smoke throughout your lifetime to more than 20 in 100 if you smoke a pack of cigarettes every day. That's according to Professor Kevin McConway at The Open University. And lung cancer isn't the only type of cancer caused by smoking. Isn't it nice to have the whole picture? From cancer survival rates to your energy bill, there are too many topics we can't yet keep an eye on. We rely on your donations to continue and grow our factchecking efforts. To support us, please donate today.